A big chunk of that number comes from “new outlets” of distribution, and while Marvel hasn’t released specific information, it’s not a stretch to assume that one of those outlets is Loot Crate, which singles out Star Wars as a featured property for January’s box of geek and gamer goods. That number is further inflated by a huge number of variant covers—more than 68 and counting—so 1 million copies doesn’t mean 1 million readers, but it could if Marvel was able to get this comic into the hands of casual Star Wars fans. This new ongoing series is geared to appeal to the audience that loves those original three films and just wants to spend more time in that world with those characters, and the creative team delivers a first issue that feels like classic Star Wars from beginning to end. 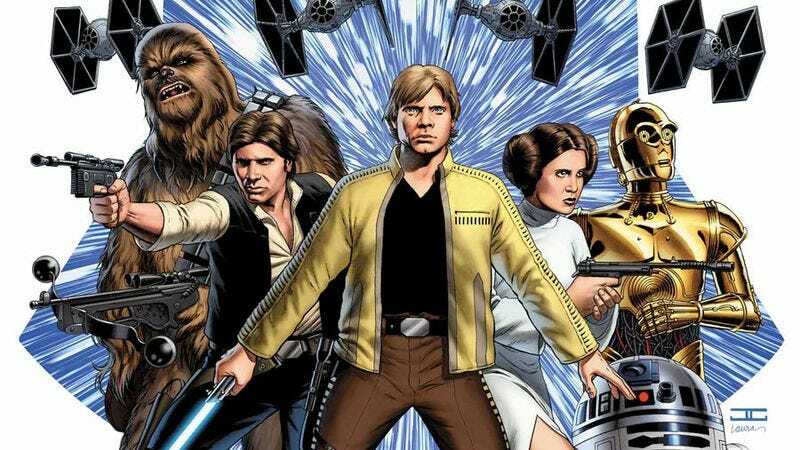 Writer Jason Aaron crafts a story that isn’t anything new—Han, Luke, Leia, R2-D2, and Chewbacca team up to take out an Empire outpost when Darth Vader arrives to seriously muck up their plan—but he does remarkable work capturing the voices of these characters. Considering Aaron’s status as one of the best writers of badasses in comics (see: Scalped, Wolverine, Thor: God Of Thunder, Southern Bastards), it should come as no surprise that he has an exceptional handle on Han Solo’s charming rogue personality, but he does equally strong work with the rest of the cast: Leia is compassionate but fierce, Luke is headstrong and naive, and C-3PO is overly chatty and slightly aloof. Aaron’s Vader doesn’t say much, but he speaks volumes with his actions, revealing his ruthlessness by sacrificing Stormtroopers to shield himself from Chewbacca’s assassination attempt before unleashing the power of the Force on the Wookiee shooter. Aaron’s dialogue captures the sound of these characters, and John Cassaday’s artwork captures the look with uncanny likenesses to the actors. Cassaday’s faces had taken a dip in quality toward the end of his Astonishing X-Men run and throughout his Uncanny Avengers issues, but being forced to work off of actor likenesses considerably improves that element of his artwork in Star Wars #1. The likenesses aren’t all picture perfect (nor should they be), but for the most part, Han, Luke, and Leia consistently look like Harrison Ford, Mark Hamill, and Carrie Fisher. That attention to detail extends beyond the likenesses to the environments, costumes, and machinery, and his slick linework highlights the timeless design that has helped Star Wars stay relevant almost 40 years after its debut. Marvel’s $4.99 price for big event comics is a steep hurdle, but at least Star Wars #1 offers more content and fewer ads at that price. (The only two ads that interrupt the story are for businesses that help people buy and sell their toys, providing a clear idea of Marvel’s target demographic for this series.) This first chapter contains 30 pages of story—10 more than the publisher’s standard $3.99 comics—and that doesn’t include the four pages allotted to the dramatic opening sequence, which replicate the beginning of a Star Wars film with a series of splash pages. That opening sets the tone for this cinematic issue, and the page turn from “A long time ago in a galaxy far, far away…” to the two-page title splash is so effective you can almost hear John Williams’ iconic score blasting in the background. Just like in the films, that opening sequence smoothly transitions from the expository text scroll into the first shot of the action, and Cassaday does great work evoking Gilbert Taylor’s cinematography in his layouts. Most of his pages for this book are composed of wide-screen panels that span the entire width of the page, delivering visuals that function almost like storyboards. He does switch up the layouts every so often—usually to make action sequences stand out—but for the most part, Cassaday keeps it wide-screen. One of the benefits of this structure is that it creates a sensation of camera movement as the images change while the framing doesn’t. Sometimes that motion is slick, like in the first story page that slowly pans down to show a cargo ship flying toward a distant planet, and sometimes it’s frantic, particularly with the quick cuts in the fight scenes pitting Han, Luke, and Leia against Empire forces. Another major benefit of wide-screen layouts is that they work very well for guided-view digital comics, and Star Wars #1 looks fantastic on a mobile device. The action moves cleanly from panel to panel, and going through the story one image at a time allows the reader to thoroughly examine Cassaday’s evocative work with colorist Laura Martin. Cassaday’s art is especially cinematic thanks to Martin, who uses a realistic color palette applied with intense specificity to create lifelike characters and environments. Even with this emphasis on realism, Martin still pays attention to how her colors heighten the atmosphere of each scene, alternating between arid earth tones and cool blues to build tension before incorporating stark red panels when the danger rises for the heroes. Stars Wars #1 is entertaining and very pretty, but at the same time, it’s hard not to get a feeling of déjà vu. The period between A New Hope and The Empire Strikes Back has been well documented in comics, from Marvel’s original 1977 Star Wars comic series to Brian Wood’s recently concluded Star Wars title at Dark Horse Comics, and while those stories are technically not considered canon, they still exist. Star Wars is just one of three new ongoing series set during this time, and while the creative teams for Darth Vader (writer Kieron Gillen, artist Salvador Larroca, and colorist Edgar Delgado) and Princess Leia (writer Mark Waid, artists Terry and Rachel Dodson, and colorist Jordie Bellaire) are impressive, Marvel runs the risk of exhausting this period between the two best-regarded installments of the film series. The risk is there, but it may never be a problem if every issue can maintain the quality of Star Wars #1 and deliver a thrilling story that is true to the source material in writing and art.